Hey everybody! Tamra with Day Services here, just checking in with the monthly wrap up. Can you believe that May is already over?! While the month sped by, we took advantage of every opportunity to try new things, visit new places, and create new experiences. Che-che-check it out! Around Here :We’re Pretty Picky! 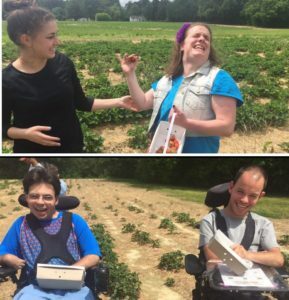 On the first of May, we had an amazing day, thanks our friends at Gallmeyer Farms Strawberry Field. We were thrilled when Steve, the owner of the field said that we were the first group to come by, and that all the strawberries were freshly grown for us to pick. #Score! To top off our berry picking experience, Steve gave us a lift around the field on his tractor. The customer service we received was great, the field was super accessible, and the fresh berries we picked were deliciously sweet! We will certainly be back for year #3 next May! Yoga is relaxing, therapeutic experience that people of all ages and abilities can enjoy. It involves breathing, control, movement, and has some awesome health benefits when practiced regularly. Our yoga instructor, Cowboy, showed us some amazing moves, and motivated us to relax, and do our best. We nailed it. 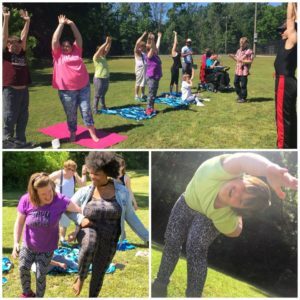 Check out this article, dedicated to yoga moves for people that use wheelchairs. Around Here: We want more, Can we get an Encore? The VA Repertory Theater is one of the largest acting companies in Central Virginia. 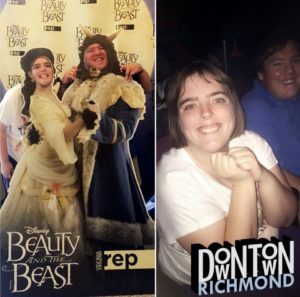 We had the pleasure of visiting the Broad Street location in Richmond to witness firsthand some phenomenal acting skills during their spring production of “Beauty and the Beast.” Although the plot was familiar, the talented performers kept us on our feet– we wanted more with each scene! We were pleased to learn that they offer select matinee shows that work well with our schedule and our budgets. We recommend you visit, as their show variety is endless, and quality is A1. Visit the VA rep website for a list of all their showings! Make sure you tell us all about it! Richmond is one of our favorite places to visit around here, so getting a beautiful view of the city on our adventure was a double win! This month, we visited the RVA slave trail, in the Manchester area of Richmond. 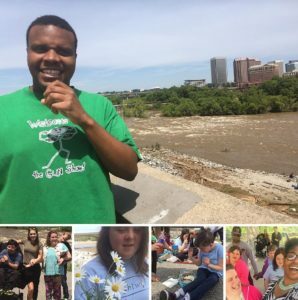 Not only did we WIN with a city view that can’t be topped, but the weather was perfect for a nature adventure! We had lunch by the river, exercised on the trail, took some selfies, and even managed to pick some daisies along the way. The trail is about 4 miles, offering activity options such as fishing, and educational historical facts posted throughout the trail. Definitely a fun (and free) activity that we encourage you to try if you are in the Richmond area! Which is why Pie Five was a hit! We rolled in, picked our crust, and chose any (and every) topping that we wanted. The options are endless and boy did we get crazy our pies. If you’re a pizza lover, and you’re all about personalizing, this place is for you! 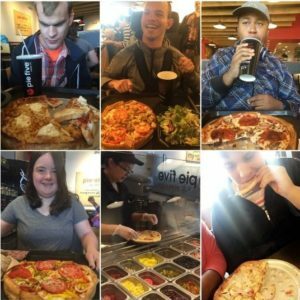 Branches is all about offering choices, and honoring them, no matter how crazy mushroom banana yellow pepper pizza may seem, (lol) In all, we had a blast! Thanks for following our wild adventures around here! As always, let us know if you stumble across something cool you think we’d like to try!